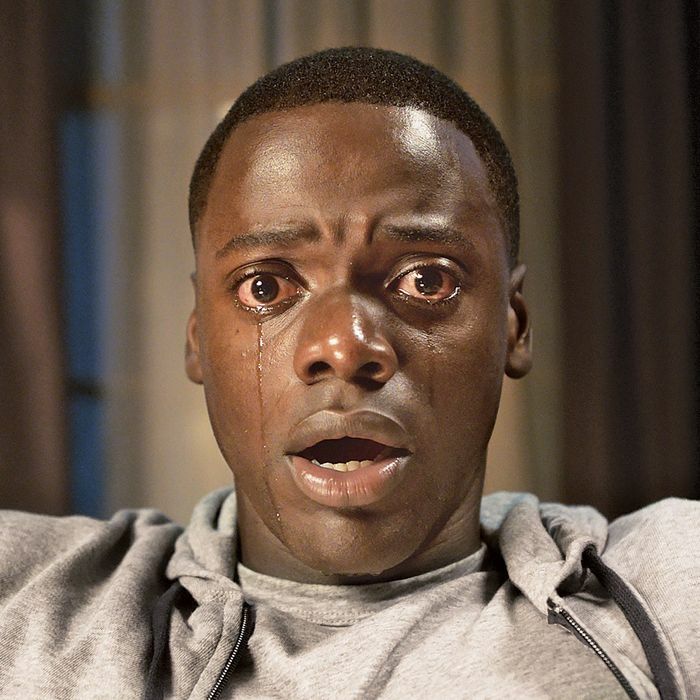 Daniel Kaluuya in Get Out. Jordan Peele’s Get Out is the satirical horror movie we’ve been waiting for, a mash-up of Guess Who’s Coming to Dinner? and The Stepford Wives that’s more fun than either and more illuminating, too. Daniel Kaluuya plays Chris, a black photographer who travels to an affluent suburb with his white girlfriend, Rose (Allison Williams), to meet her family. Before they leave, he learns she hasn’t told them he’s black, and he’s a bit nervous — and so are we, given that the movie opens with a young black man getting snatched from a suburban sidewalk and thrown into a white car playing the ’30s music-hall ditty “Run, Rabbit, Run” (“Run rabbit — run rabbit / Run! Run! Run!”). No worries, though. Rose’s parents, Dean (Bradley Whitford) and Missy (Catherine Keener), turn out to be conscientious liberals and hugely welcoming. Dean tells Chris he’d have voted for Obama a third time. And Dean is mindful of the awkwardness Chris feels in the presence of their black housekeeper and gardener, who are a couple. Dean insists that the two have been with them a long time and that they’re like family. He’s not far off. This is Peele’s directorial debut, but it feels like the work of someone who has been making features for years. He uses the wide screen like John Carpenter in Halloween, to lull but decenter you. His “Boo!” moments make you jump and then laugh at yourself for jumping — then steel yourself to jump again. His surrealist sequences are gorgeously lyrical, his gore, when it finally comes, Pollock-splattery. His years crafting sketches for Key & Peele have taught him the difference between parody and satire. There are plenty of savory horror tropes, but Get Out wouldn’t work as well if, in the real world, white people weren’t so unconvincing in their assurance that black people have little to fear apart from those fascist-racist cops and their fascist-racist Republican enablers. Peele is after less obvious targets: rich white liberals as black soul-suckers. The performances are devilishly clever — heightened but without a whisper of camp. Whitford’s Dean is too chummily direct to be hiding anything, right? A villain would be more evasive. Keener is the psychiatrist as warm, tousled Earth Mother: Should Chris fear the way she gets into his head — into the feelings he has about his own mom, killed in a hit-and-run accident so many years before — or welcome her attempt to get him to confront his repressed guilt? Caleb Landry Jones, one of the more interestingly weird actors in movies, plays Rose’s brother, who can’t seem to control his competitive instincts and always wants to start some kind of street fight. The vivaciously pretty Williams makes Rose the biggest mystery. She picks up on the strange, threatening vibes in the house and lets Chris know he’s not imagining anything. A true conspirator would assure him that everything’s okay. But she’s in there helping him sort out what’s real and what’s imagined. She really cares. Kaluuya, a Brit, is a perfect hero for a movie like this. Chris registers on some level that he’s a character in a horror movie — he can’t believe how bizarre these people are behaving — but the dislocation is deeper and more disabling. LilRel Howery is Chris’s boisterous TSA-agent friend who tells him not to go into suburban white people’s houses, which is a twist on white people telling innocent girls not to walk down dark urban streets. Get Out is a ludicrous paranoid fantasy, but that doesn’t mean it’s not alive in the unconscious. Having it out there in so delightful a form helps us laugh at it together — and maybe later, when we’ve thought it over, shudder. *This article appears in the February 20, 2017, issue of New York Magazine.